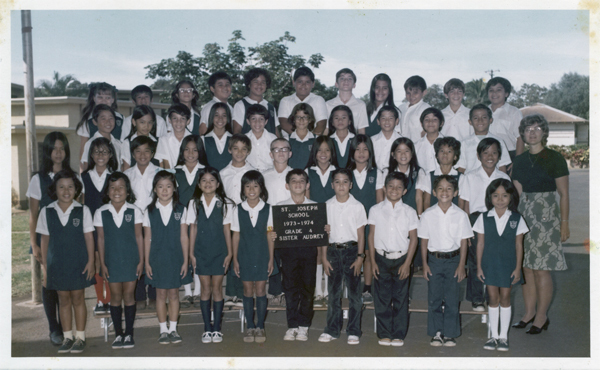 First Row: Felice Morikawa, Regina Ganzagan, Mary Mau, Carla Lau, Roberta Angut, Anthony Morikawa, Raphael Carreiro, Warren Kaleimamahu, David Amorozo, Shelly Santos. Second Row: Rea Aldanese, Karen Sabog, Dickson Au, Pauline Mendoza, Jeffrey Paresa, Daniel Nahill, Edna Respicio, Kristine Apostol, Wendy Balasbas, Gloria Manzano, Todd Ganzagan, Sister Audrey. Third Row: Don Kim, Prescilla Cabudol, Cedric Ross, Cynthia Regohos, Sydney Ross, Shantel Fernandez, Jolene Tandall, Paul Yap, Alan Keanu, Shawn Sandry. Fourth Row: Maria Smith, Clayton Taparra, Lisa Lum, John Abreu, Rene Tavares, Gaylen Ikeda, John Blankenship, Cindy Yoshida, Andrew Rzonca, Michael Silva, Gregory Moniz.